Did You Know CB Skin Secrets Has All That? 1) First off, enrollment is open for a radiofrequency study in the treatment of dermatologic conditions (cellulite, loose skin/wrinkles and fat) for males or females 18 or older in generally good health currently seeking treatment. There is NO compensation for your participation however, if you qualify, you will receive a discount for up to 4 treatments. Enrollment ENDS May 27, 2015! So, contact me right away if interested. 2) If you are bothered by thinning hair or hair loss, come discuss hair regrowth treatment options with PRP and MicroPen! 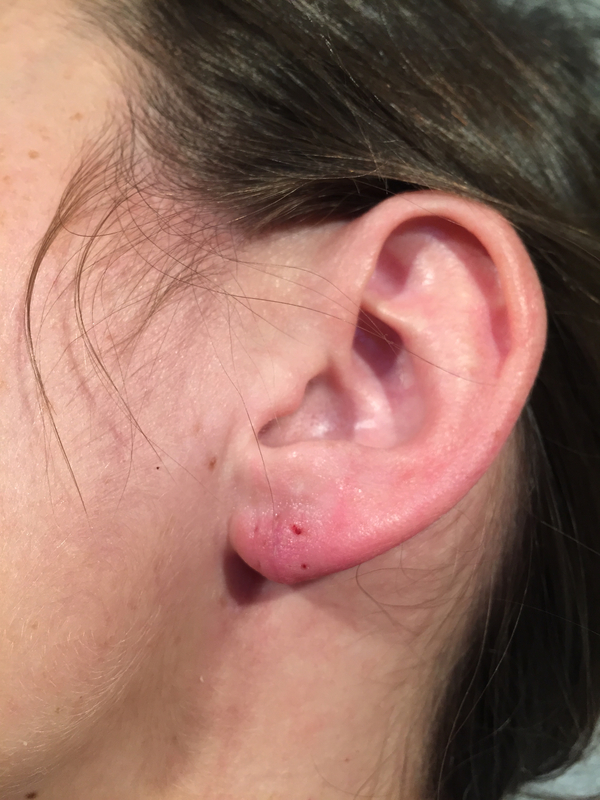 3) Torn earlobe repair is done at CB Skin Secrets! This can be done while you are awake and comfortable. Included is a photo of a recent repair. Prior to repair, the lower edge of the earlobe was completely torn from an earring pulling through. 5) Silhouette lift is an office procedure done while you are awake and comfortable while giving results that last years with significantly less risk, cost and downtime than traditional face lifts. Options are for brow, midface/jowls and neck. Re-lifting can be done years later with an even less invasive procedure. 6) Unwanted dark hair? Get rid of it with BBL permanent hair reduction treatments! You will be surprised at how easy, comfortable, AFFORDABLE and effective this is! There is no need to go anywhere else, the ideal solution is here! 7) Are your hands giving away your age? Fill them with a quick, easy to tolerate treatment of Radiesse! You will love the instant gratification of this rejuvenating option! 8) Get a $50 prepaid card if you get Xeomin, the 3rd generation botox, or Belotero, a great new filler for etched lines or sunken tear troughs done in May or June! Hurry, while supplies last and before the codes for the FREE gift cards expire on June 30, 2015! This MAY be combined with other offers and CAN be used towards ANY treatment or product I offer! 9) FREE stuff with ANY FILLER! The promo for May – June 2015 is that with any filler, PRP, Juvederm, Radiesse or Belotero, you get a FREE makeup bag, choice of sunscreen from Obagi AND a FREE Obagi Blue Radiance Peel! Total value of FREE gifts ~$160! 10) There are ALWAYS ways to save at CB Skin Secrets! Your Obagi Loyalty is rewarded with 20% of all Obagi purchases being put toward Light/Laser credit with NO LIMIT. Packaging Light and Laser treatments together saves 10% for a series of 3 and 15% for a series of 6. Additional promos run 2 months at a time and can usually be combined with the standing offers. You always work directly with me, your General Surgeon with experience in Aesthetics since 2008. All this and MORE at CB Skin Secrets! So, come see me! This entry was posted on May 20, 2015, in Uncategorized. Bookmark the permalink. ← Obagi Summer Gift Bags Just in Time for Mother’s Day!